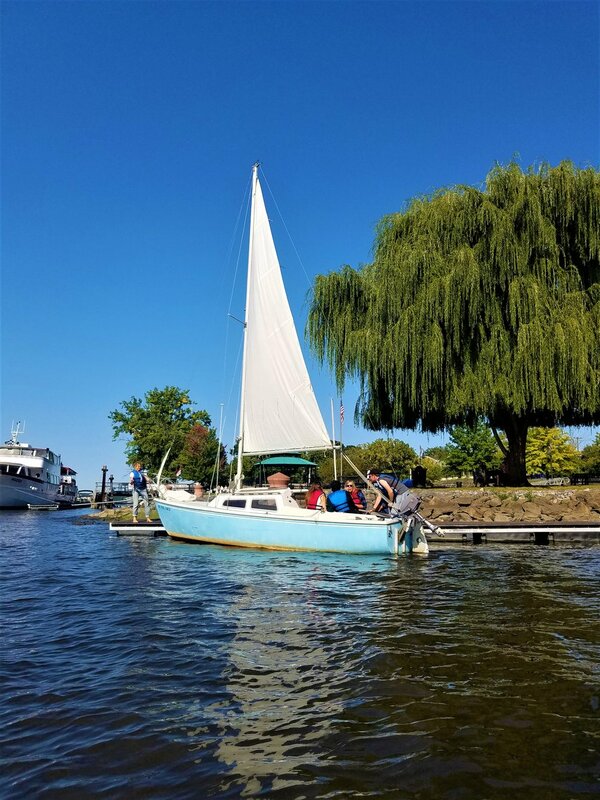 Please join the Hudson Sloop Club for the last free community sailing day of 2018 on Sunday, October 21st! Enjoy the beautiful fall foliage while sailing along the Hudson River. We will host free sailing (donations welcome!) for the Hudson Community at the Hudson Waterfront. Boats will be leaving from the public docks, first trip out at 1 pm, last trip back by 5 pm. 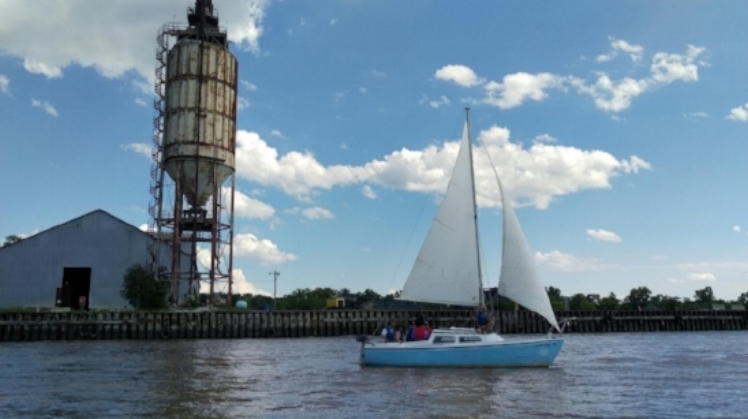 Come out and learn about the Hudson Sloop Club, The Hudson River and the Basics of Sailing. No reservation needed, just show up! Anyone over 50 lbs is welcome to join us. First come, first served. If you want to volunteer and help with these or other community sailing events please reach out to info@hudsonsloopclub.org. The Hudson Sloop Club is happy to announce our next free community sailing event on Sunday, September 23rd. We will host free sailing (donations welcome!) for the Hudson Community at the Hudson Waterfront. Boats will be leaving from the public docks, first trip out at 1 pm, last trip back by 5 pm. Anyone over 50 lbs is welcome to join us. 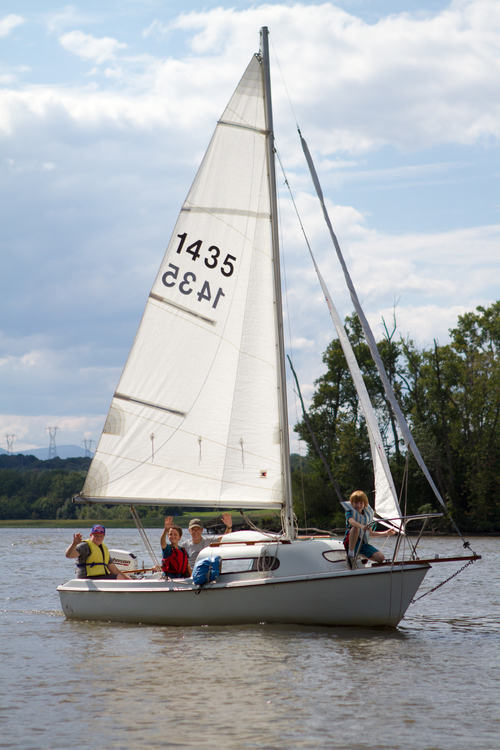 Come out and learn about the Hudson Sloop Club, The Hudson River and the Basics of Sailing. No reservation needed, just show up! First come, first served. If you want to volunteer and help with these or other community sailing events please reach out to info@hudsonsloopclub.org. Hope to see you there! The Hudson Sloop Club is happy to announce our next free community sailing event on Sunday, August 19th. We will host free sailing (donations welcome!) for the Hudson Community at the Hudson Waterfront. Boats will be leaving from the public docks, first trip out at 2 pm, last trip back by 6 pm. Anyone over 50 lbs is welcome to join us. Come out and learn about the Hudson Sloop Club, The Hudson River and the Basics of Sailing. No reservation needed, just show up! First come, first served. If you want to volunteer and help with these or other community sailing events please reach out to info@hudsonsloopclub.org. Hope to see you there! 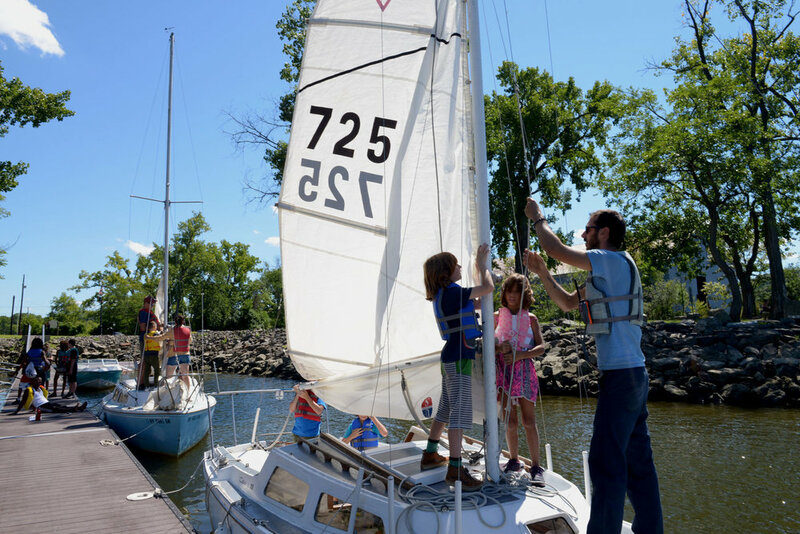 The Hudson Sloop Club is happy to announce that our free community sailing will start this weekend, July 15th! We will host free sailing (donations welcome!) for the Hudson Community at the Hudson Waterfront. Boats will be leaving from the public docks, first trip out at 2 pm, last trip back by 6 pm. Anyone over 50 lbs is welcome to join us. Come out and learn about the Hudson Sloop Club, The Hudson River and the Basics of Sailing. No reservation needed, just show up! First come, first served. If you want to volunteer and help with these or other community sailing events please reach out to info@hudsonsloopclub.org. Hope to see you there! Come down to the future site of the Nack Center to learn more about the project and help clean up the site. 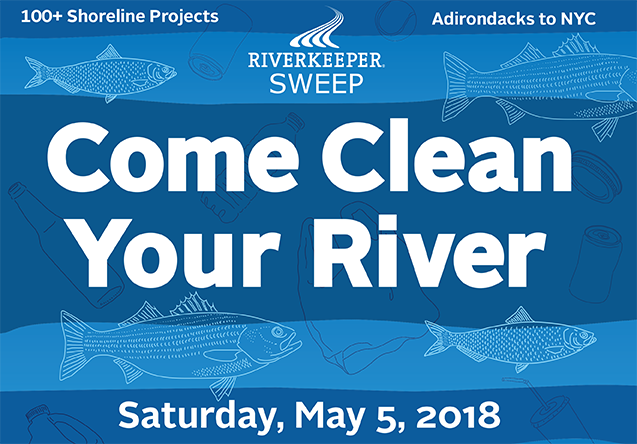 Bring your work gloves, boots and long sleeves to the Hudson Waterfront between noon and 3pm. We will be landscaping and cleaning up garbage and debris but also taking time to show people around the site, talking about Nack Center and the next steps in its development. All participants(of age) get a ticket for a free beer at Crossroads Brewery in Athens. Park in the gravel parking lot at the Hudson Waterfront park and follow signs to the Nack Center. As the mercury drops we are pulling the boats in for the winter and looking back on another great season. 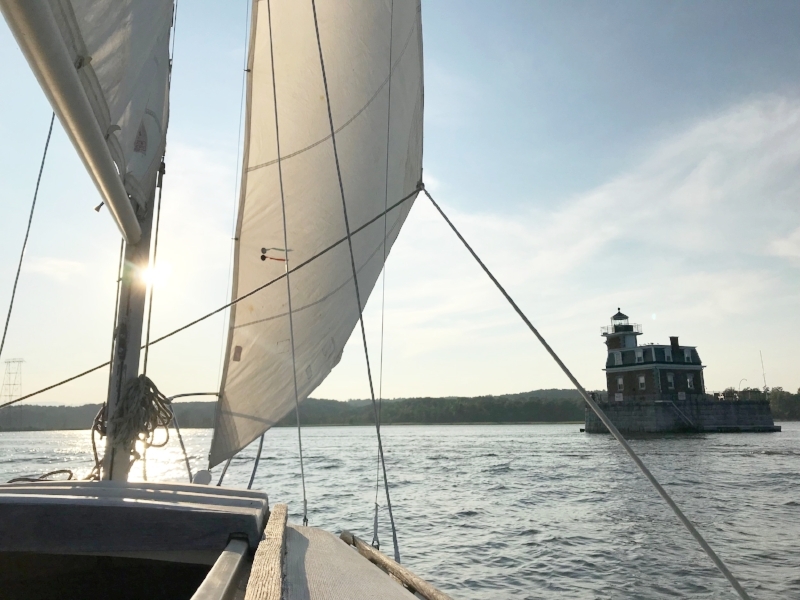 We took out over 180 members of our community on free sails this year many of which had never been out on the Hudson before. Our community sailing program is done for the year but we want to thank all of our great volunteers for making it happen. Margot Becker, Jason Marlow, Roman Horst, Brett Miller, Emma McCann, Ed Csukas and Christin Ripley all put in many hours to make the program happen. A big thanks to Sam Merrett our "On the Water" coordinator for keeping the program running year after year. Sailors take note that our September community sailing day will be moved from Sunday 9/3/17 to the following Sunday 9/10/17. 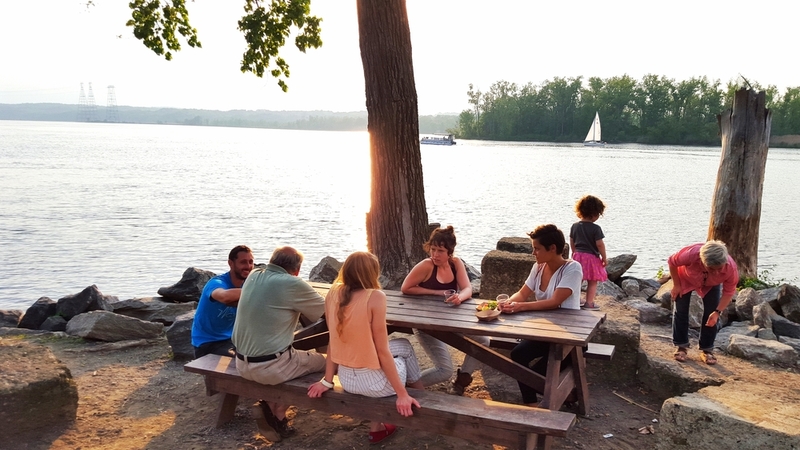 It will still be at our regular time from 2pm to 6pm at our usual meeting spot at Ricks Point at the Hudson Waterfront Park, and will be FREE as always open to the public. So come on down and get out on the River with the Sloop Club NEXT Sunday. They were almost too small to see but luckily we had microscopes. We would like to thank Chris Nack and Family for giving us an amazing workshop at the Hudson Waterfront. We caught larval shad from right off the docks in Hudson and put them under microscopes to see what they looked like up close and personal. 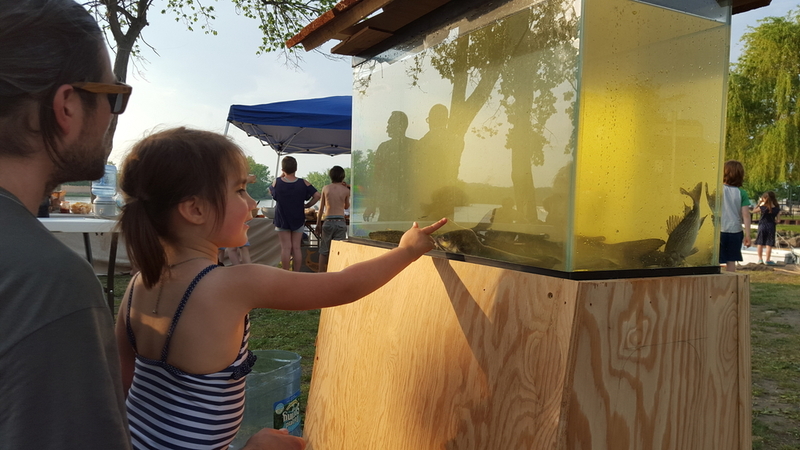 There was a great turn-out, and everyone learned a huge amount about shad in the Hudson River. The event was sponsored by New York Sea Grant, Virginia Sea Grant, the Hudson River Foundation and SUNY ESF. Thanks so much to everyone who helped put this great event together and to everyone who came out. On the morning of Wednesday, January 18th, we learned that The Riverloft building at 59 N. Front St. was burning. 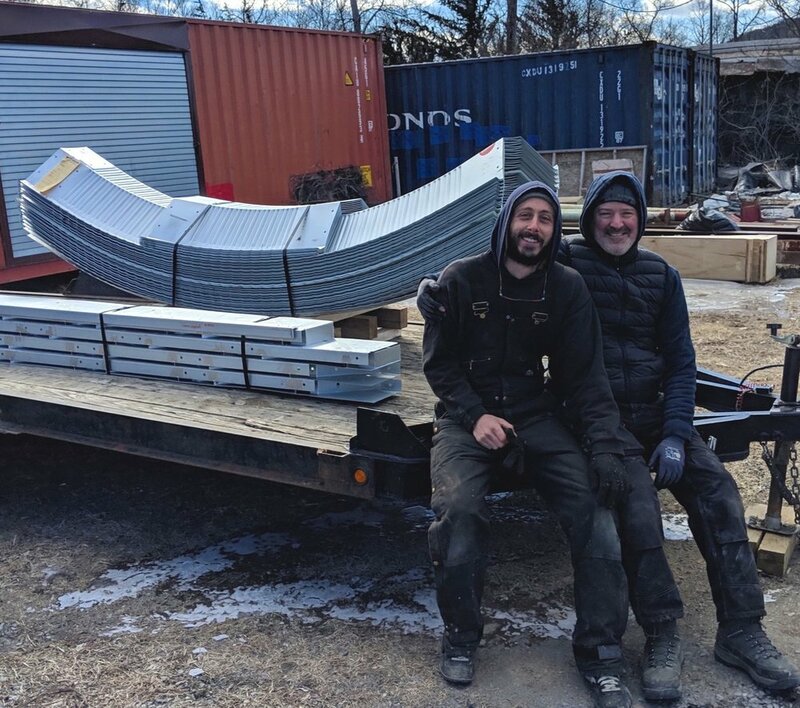 The building, which was recently donated to our community partners and friends at Kite's Nest, also housed all of the Sloop Club's materials and supplies. The fire destroyed the entire building and everything in it. The building was completely demolished by the end of the day. Kite's Nest and The Hudson Sloop Club suffered deep, material losses, but we are so grateful that no one was harmed, and no lives were lost in the fire. We are so saddened for Kite's Nest, whose dreams for the future were deeply invested in their plans for the building and the site at 59 N. Front St. We will do all we can to support them as they begin to imagine new ideas and make plans for the future. Our organizations will continue to work together to rebuild, and grow stronger. In the midst of this disaster, we are so grateful to the firefighters, police, and the first responders who fought the fire throughout the night, morning and into the evening, keeping our community safe. We want to thank the more than one hundred firefighters from Hudson, Greenport, Stottville, Claverack and Catskill who worked so hard to contain and fight this fire, as well as the Mayor, the DPW, the Hudson City Police Department and the State Fire Investigators that spent hours and hours at the building. We also want to thank the many, many community members that reached out to The Hudson Sloop Club throughout the day on Wednesday, and in the past few days to offer their support, we are so grateful to live and work in this amazing community. We are processing and evaluating this loss, connecting with our partners at Kite’s Nest, and throughout this community and we will be in touch with future plans for rebuilding. Thank you for your ongoing generosity and support. The Hudson Sloop club will be hosting the first in a continuing series of community meetings to discuss the development and construction of the Everett Nack Estuary Education Center on Monday September 19th at 5:30pm. The center will be a community resource, open to the public and as such we are excited to offer a public forum where we will update the community on the current status and progress of the Center, answer questions and take input and feedback. The meeting will be hosted by our partners at Kites Nest and will begin with a quick walking tour at 5:30 pm and will continue with a slideshow and discussion at 6pm with snacks and refreshments. 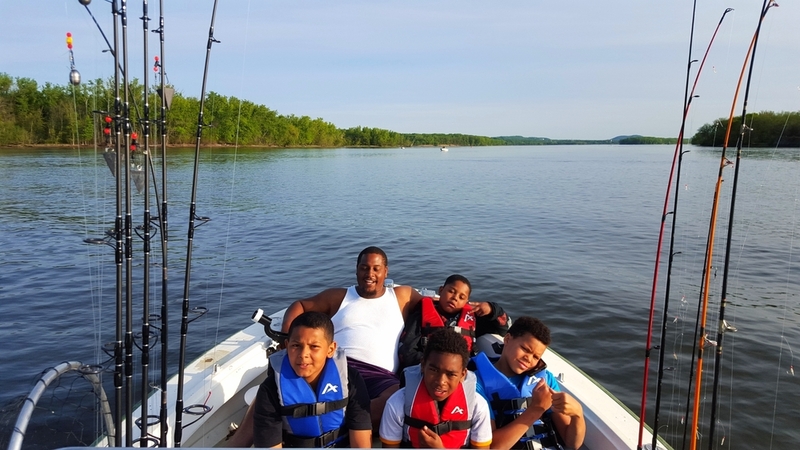 Twenty campers (ages 9 - 15) came together to discover the active community of fish and wildlife in the Hudson River Estuary, while getting a taste for steering a sailboat. During this one-week workshop hosted by our partners at Kites Nest, campers participated in a combination of land and water-based activities: understanding how sailboats work, learning maneuvers and vocabulary, going fishing, testing water quality, and building simple tools to read wind, current, and speed. 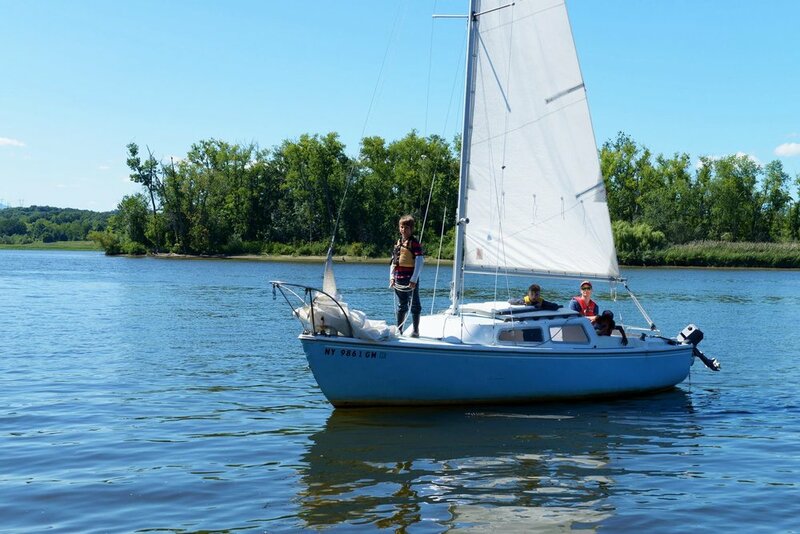 Each day, (weather-permitting), campers spent time on the water, sailing: trying their hand at steering and trimming sail, learning sailing fundamentals, and going places only accessible by river. 2016 MIDDLE SCHOOL BOAT FLOATS!!!! 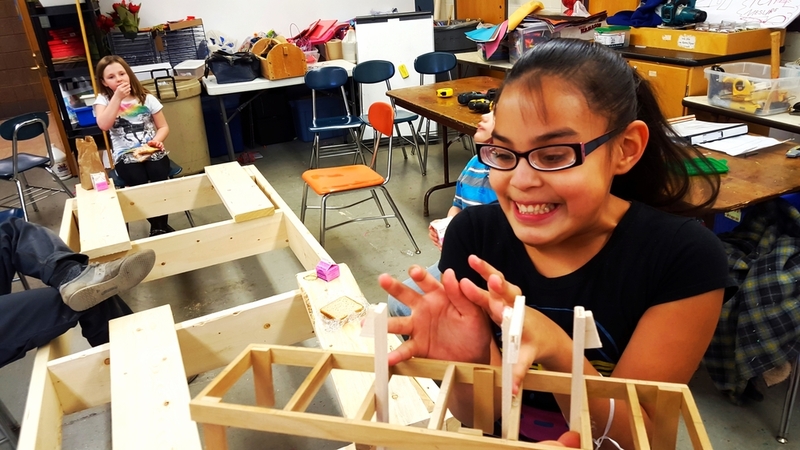 With only a few days left in the school year an all star crew of 4th, 5th and 6th graders from Montgomery C. Smith intermediate school finished the boat we have been building after school for the past 10 weeks. The small row boat which was aptly named "Boat Line Bling" passed all flotation and hydrodynamic testing with flying colors at its launching at Oakdale this Tuesday. 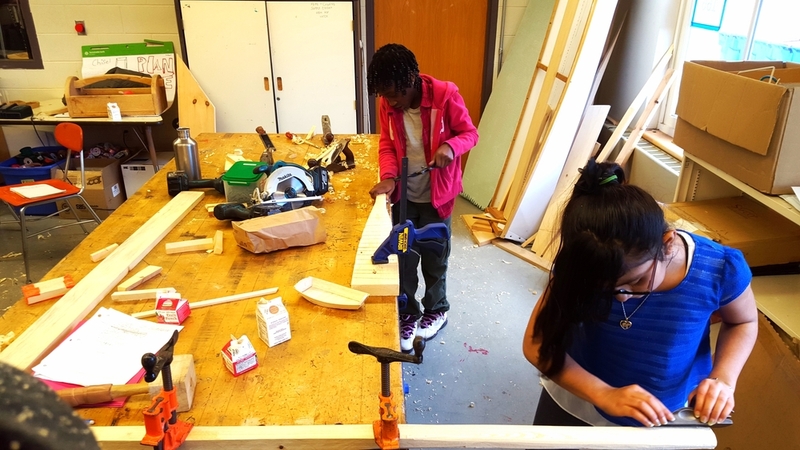 Mathew Gonzalez, Jennifer Winfield, Elyza Medina, Chanelle Perkins and Ashanti Armstrong spent the entire spring working to craft the boat start to finish, learning the crafts of woodworking and boat building. A big thanks to Joanne Allie, Kathy Clark, Mark Brenneman and everyone at the Hudson Blue Hawk Nation After-school Program for all their support and hard work. 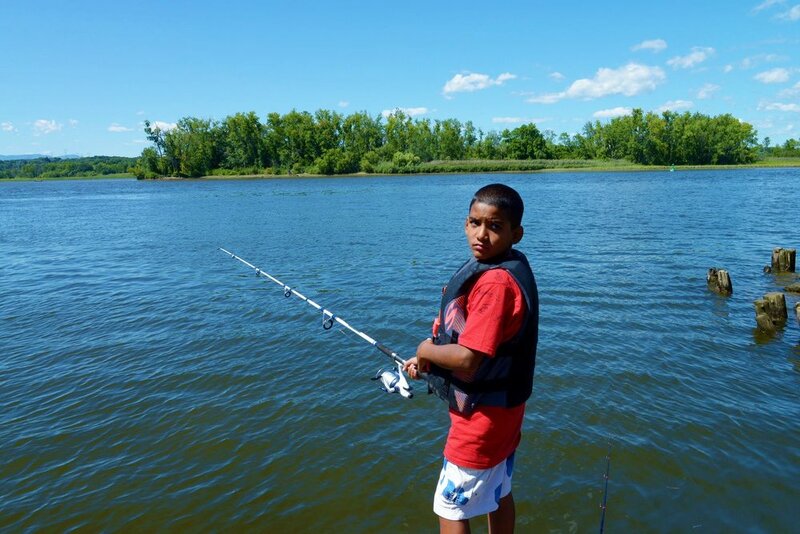 Spring of 2016 has marked the arrival of our exciting new fishing program. 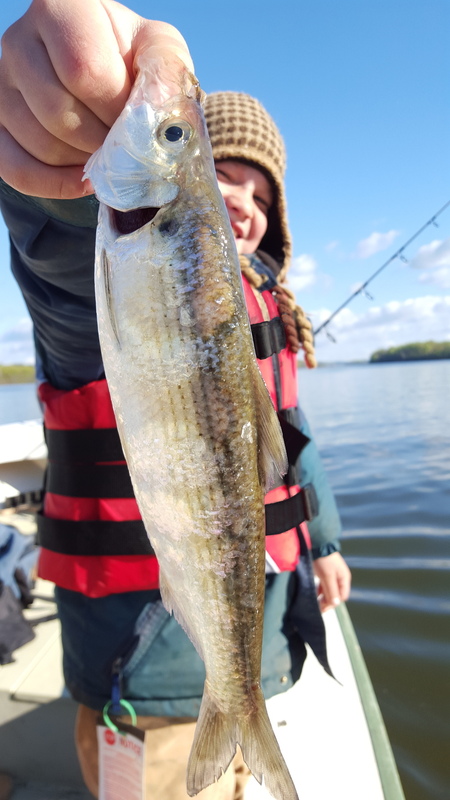 With the influx of Striped Bass, Herring, Shad and other migratory fish into Hudson River on their annual spawning run, the Sloop club followed in chase with rod, reel and net to give our community a chance to experience the world class fishing we have available at our doorstep. Through generous donations from Colin Stair, Paul Cassidy and Vernon Evenson we were able to launch our new fully rigged fishing boat just in time for the spring migration. We were outfitted with the best of gear though the generous support of Riverview Marine and River Basin Sports. 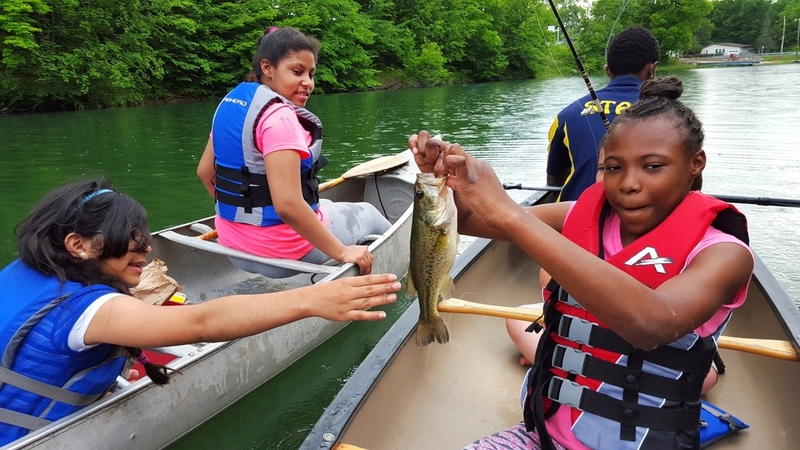 Working with our partners from the Hudson Youth Department and Greater Hudson Promised Neighborhoods we focused our efforts for this year on kids in our community who have not had access to the river or fishing opportunities, and we are happy to say that everyone who came out with us caught a fish! 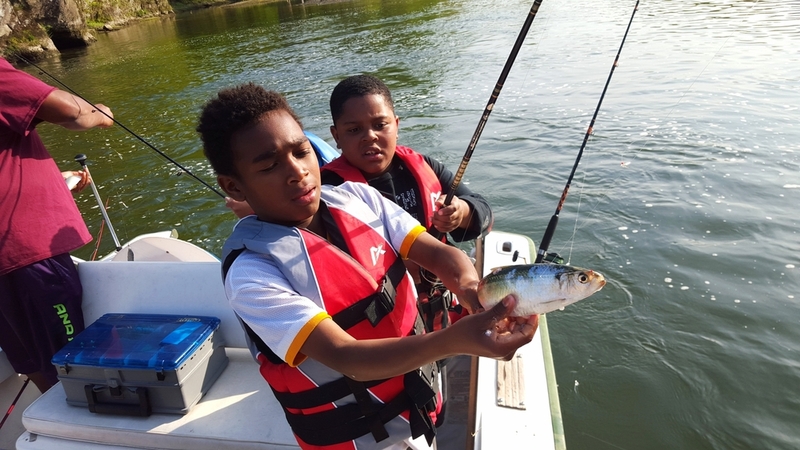 We received a huge response to this program and will be working hard to expand quickly to offer more fishing trips year round for kids and adults alike who are looking to get out and get after some fish. Friday May 27th HSC Annual Fish Fry! 3-7pm! FRIDAY FISH FRY! 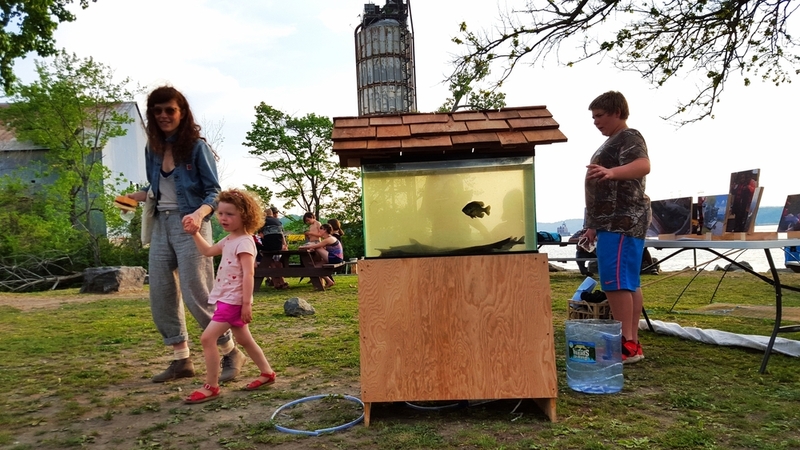 Come join us at the waterfront on Friday May 27th from 3-7pm for a celebratory potluck to mark the end of the Hudson River's spring fish migration. Bring a dish! We will be serving fish, hamburgers, and hot dogs. There will also be fishing and boat rides from the dock! 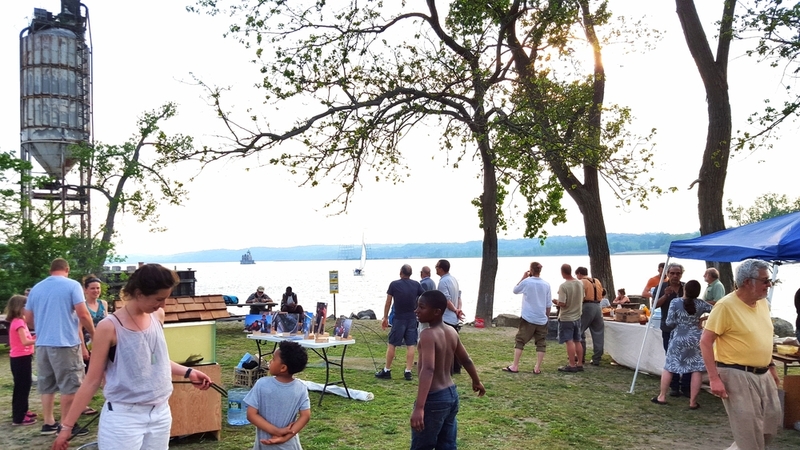 The City of Hudson, in partnership with The Hudson Sloop Club has been awarded $91,780 from the Hudson River Estuary Program to develop a community education center at the Hudson Riverfront. This grant will fund the development of the Everett Nack Estuary Education Center in Hudson, named in memory of Everett Nack, a local fisherman, naturalist, and advocate for the river. The site for the ENEEC is an acre of Hudson River frontage with the remnants of an historic pier and slips, directly south of Rick’s Point and the Hudson Waterfront Park. 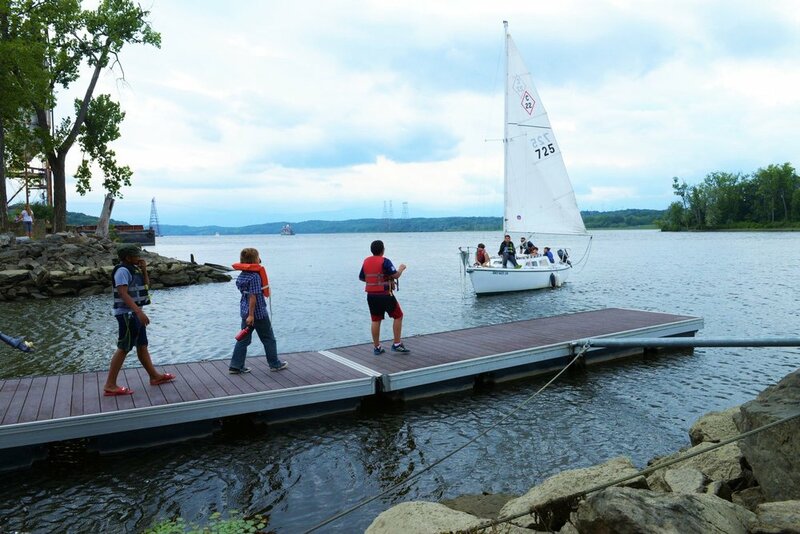 The Hudson Sloop Club will be administering the project for the City of Hudson and running the facility with partner organizations once the project is complete. The ENEEC will be designed to offer hands on and experiential displays and activities, and will host visiting environmental educators and scientists. 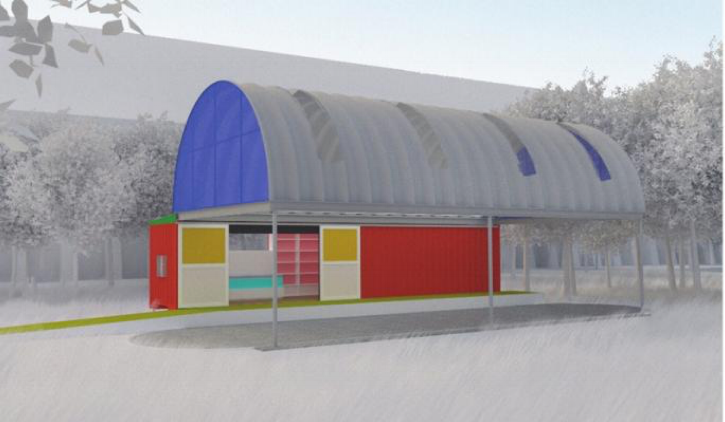 The ENEEC will also serve as a riverfront information center for community members and visitors to Hudson. An aquarium, regularly stocked with local marine life will be a visual centerpiece, alongside wildlife and habitat displays. River data about tides, temperature, turbidity, and other factors will be displayed on real time screens. 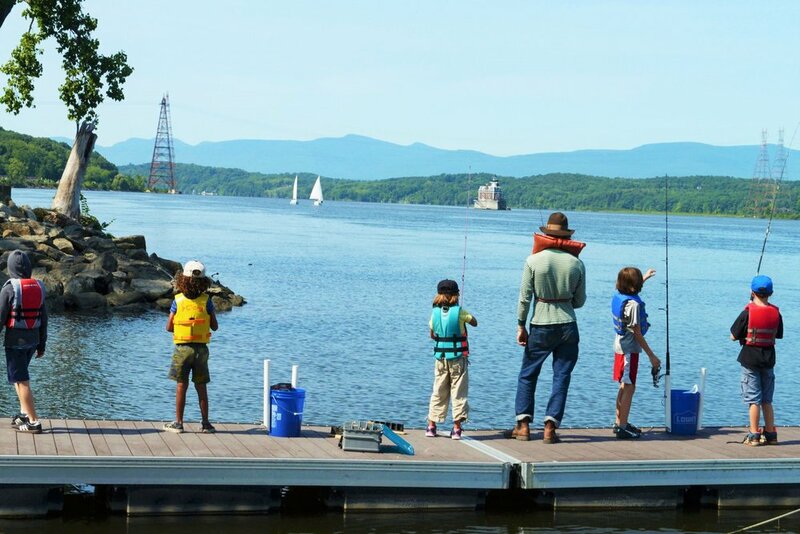 The center will have a learning library of books and resources about the Hudson River’s ecology, and history, and information about local boat rentals, tours, and other recreational opportunities. The facility will be equipped with technology for water quality monitoring and recording, for seine netting, and with shared fishing gear and tackle. A full cycle estuary viewing station will include a digital microscope connected to a computer and projector for large scale viewing, and educational purposes. When complete, ENEEC will become a resource for local scientists, students and researchers enabling access to valuable ecological data and flexible space for interpretive learning. The Center will be an educational resource accessible not only to the community within the city of Hudson, but for the larger communities of Columbia and Greene counties and the Hudson valley at large. Schools, environmental groups, summer camps, individuals and families will have access to this new facility for classes, workshops, talks and on-the-water programming. 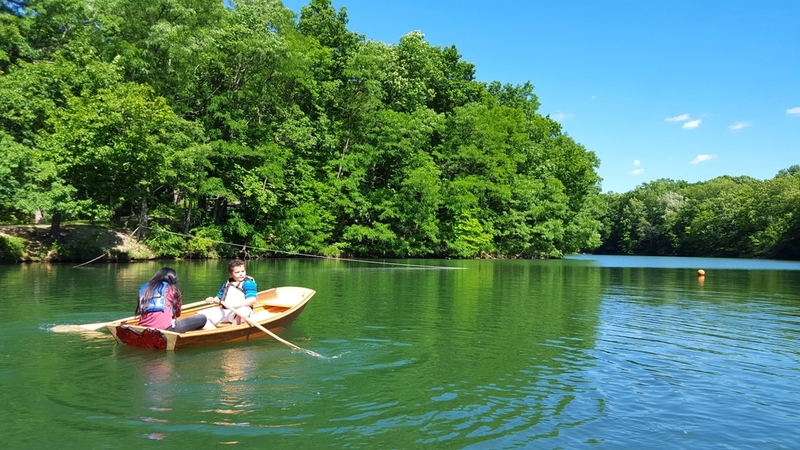 The Center's mission and programming will be developed by a collaborative team of local educational, environmental and river based organizations working together with the community. 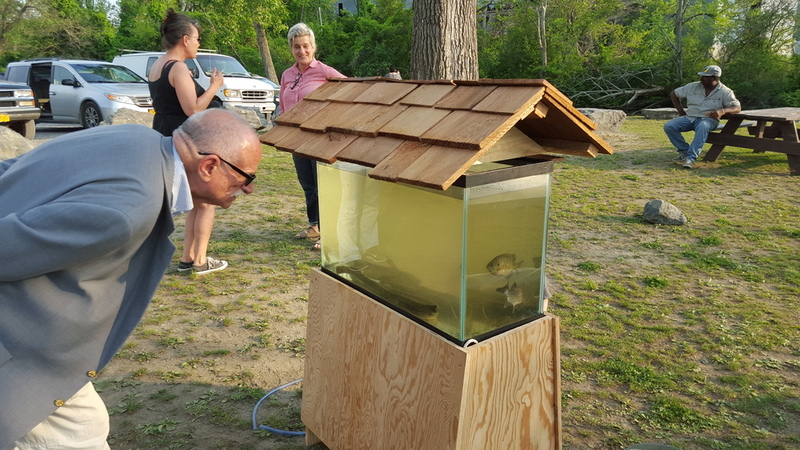 The Hudson Sloop Club is so excited to partner with City on this project, and is grateful to the Hudson River Estuaries Program for making this dream possible.